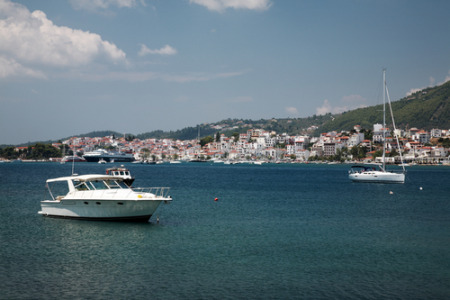 Skiathos Town is located in an area of great natural beauty on the south east coast of the island. Surrounded by pine clad hills and with the crystal clear waters of the bay dotted with verdant isles, Skiathos Town holidays offer visual treats in all directions. We have a number of cheap Skiathos Town holidays ready to transport you to this stunning place. With superb sandy beaches in the town and the surrounding resorts, holidays to Skiathos Town are popular with a wide range of visitors. Nearby Achladies offers a variety of water sports. Holidays in Skiathos Town can be taken from easter until October with temperatures reaching thirty at the season's height. If you wish to escape our uncertain weather and if you have an appreciation of beautiful landscapes, you may be tempted by our Skiathos Town holiday offers. This idyllic spot with its traditional atmosphere and friendly locals, has a range of recreational activities and sightseeing opportunities and is a very popular destination. With good hotels and eateries, as well as a plethora of shops, our bargain Skiathos Town holidays are very appealing. For our latest Skiathos Town holiday deals and for further information, please use the search facility.